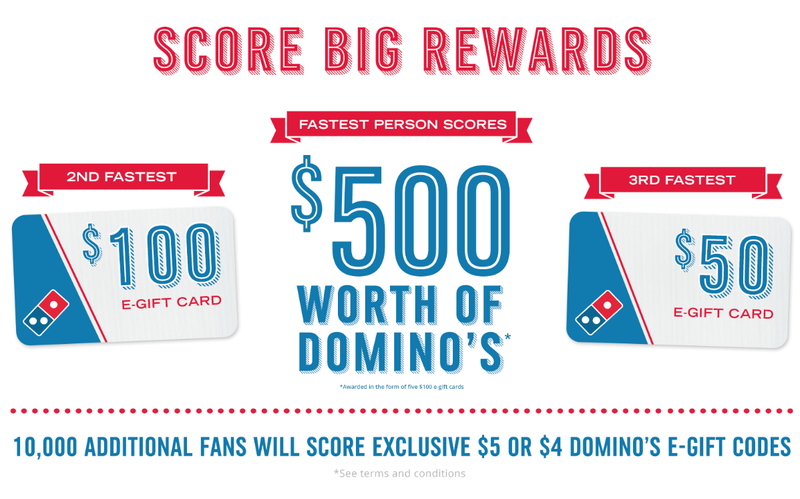 Domino's Pizza will be giving away 10,003 FREE Domino's Pizza gift cards through Quikly sometime between now and February 13th, 2019 and if you want in, you have to opt-in before it goes live. To do so, sign up or log in then click the ‘I Want In’ button. You'll receive a text or email when this Quikly goes live and if you're fast enough, you'll score a FREE Domino's Pizza Gift Card! Cell phone with data is required. GOOD LUCK! The grand prize (five $100 gift cards), first (one $100 gift card) and second (one $50 gift card) prizes do not expire. All other prizes are promotional codes which are valid through February 22nd, 2019 at 11:59 pm ET.